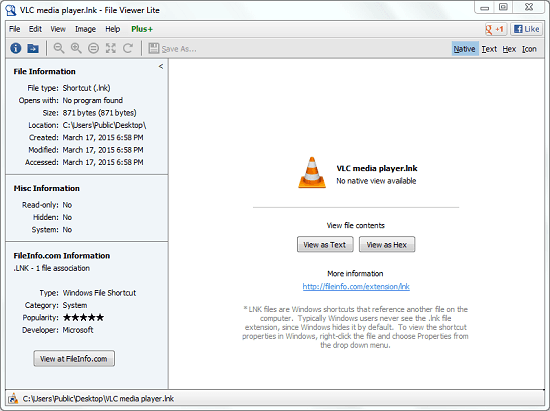 File Viewer Lite is a free software for Windows 8 and 8.1 to view different types of files with different known and unknown extensions. File Viewer Lite helps you to view all kinds of files that can be readable by the software installed on your computer or that might not be readable by them. File Viewer Lite is a compact yet powerful software for viewing all common and uncommon files. With File Viewer Lite installed on your Windows 8 PC, you don’t have to think about not having a compatible software or application to open any specific kind of file. File types supported and read by File Viewer Lite include audio, video, document, spreadsheets, camera raw files, image files, font files, web files, dos files, configuration files, windows initialization files, log files and XML files. To view any file in File Viewer Lite you can either open it using the menu of File Viewer Lite or you can drag the file to be opened and drop it in File Viewer Lite application. The file will be opened in the native view. File Viewer Lite supports viewing the file in native view, text view, hex view and icon view. Native view is the original or default view sample of the file. Text view shows the textual data of binary and text files. Hex view shows hexadecimal portrayal of the content of the file. Icon view displays the different sizes of the icon of the file. The files that cannot be properly read in their native format can be viewed as Text or Hex format. There are various additional options for the image file types in File Viewer Lite. In the Image menu, you can find options like adjustments, image rotation, image size, add shadow, effects and crop. All these options will help you enhance the image file added in the application.